Treated my parents here for a belated Father’s Day/Dad’s birthday dinner. Made reservations through Open Table and everything went great from there. The hostesses were extra accommodating to us. Our waitress was able to make recommendations and not afraid to do so. She wasn’t too pesky but did check on us throughout our stay to refill our water, bring us complimentary good eats, and make sure we had everything we needed. Definitely worth a good tip. The decor was lovely, brick, soft drapes, dim lighting, classic place settings, sectioned off bar area (in the front of the restaurant). 18 Seaboard is set in an old rail station, so the ambience isn’t too “new fangled”. Loved it – my type of nice restaurant. 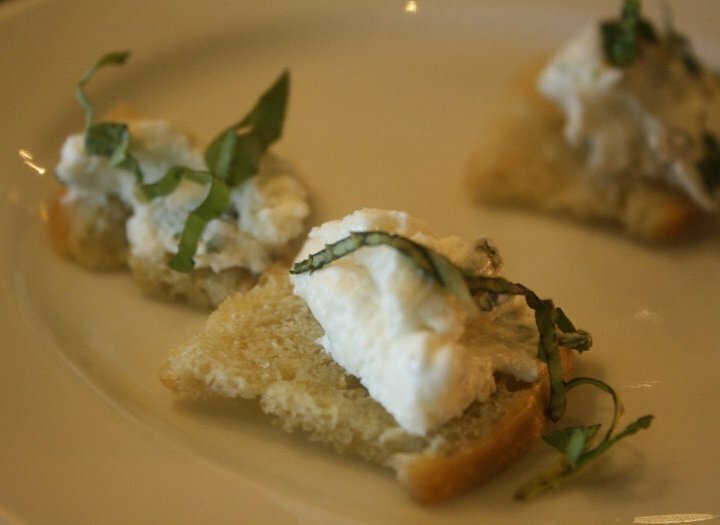 We didn’t start with any appetizers, but the kitchen gave us some crostini with their basil goat cheese. I could eat goat cheese day. This was exceptional. Creamy and bursting with flavor from the fresh summer basil. Thank you, Kitchen! I ordered a refreshing salad with peaches. 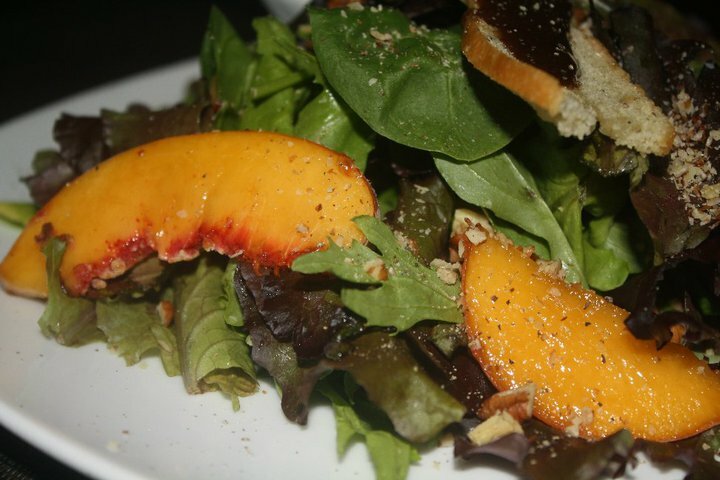 Here is their description: Pee Dee Orchard peach and field greens salad with basil balsamic vinaigrette, pecans, and aged balsamic crouton. The aged balsamic crouton was stellar and it tasted like a fruit jam. Wonderful. 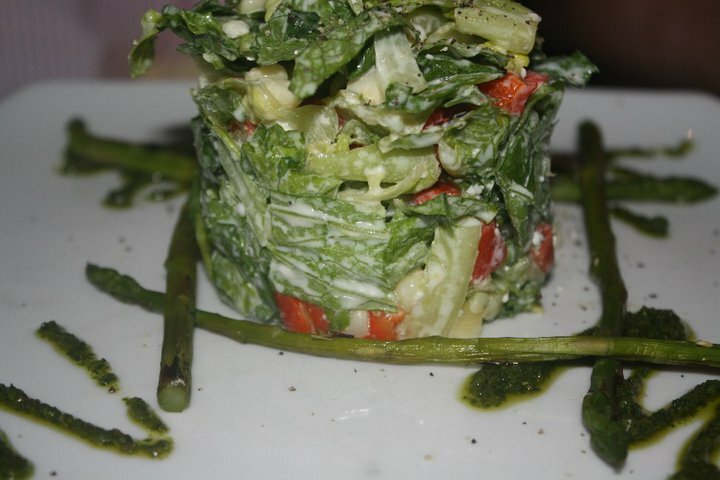 This salad was light and refreshing and Fresh! I loved it. Mom ordered the Chopped Asparagus Salad and the Black Eyed Pea Cakes. I tasted both. Mom loved her salad and ate one of her black-eyed pea cakes. Too much food! 🙂 I love asparagus! They do have vegetarian options for those who have those dietary needs/wants. 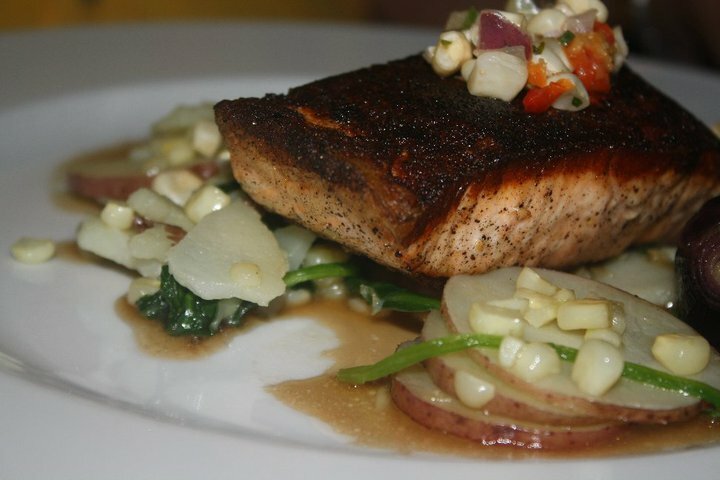 Dad got the special which was salmon (he got it blackened) with potatoes, onions, corn and spinach. I could have eaten a bowl of the onions all by themselves, maybe I should have asked for an order of them. I think they were cooked with a honey balsamic – but man, they were some of the best onions I’ve ever had. This food was local and fresh, which is something else I enjoy about a restaurant. 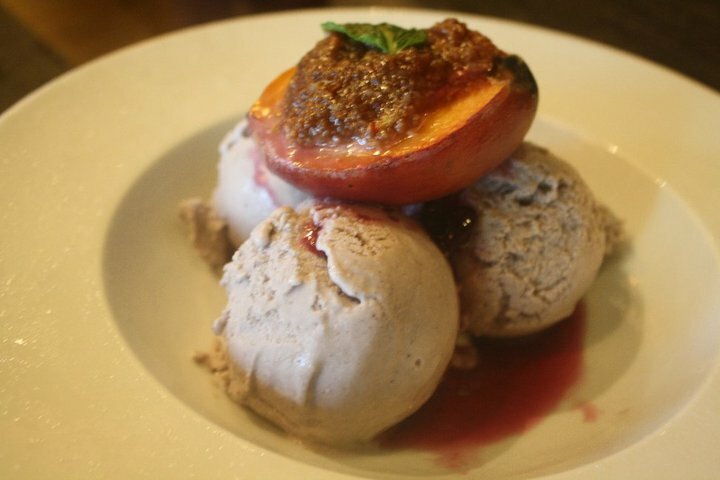 For dessert, we ordered the roasted Amoretti stuffed peach with homemade (in-house) blueberry and sprite melon ice cream. Could I get a quart of the ice cream to go please? So fresh and light. But, also a taste treat from the kitchen – little squares of blueberry cake with a blueberry mousse. The mousse was light and a perfect topping. 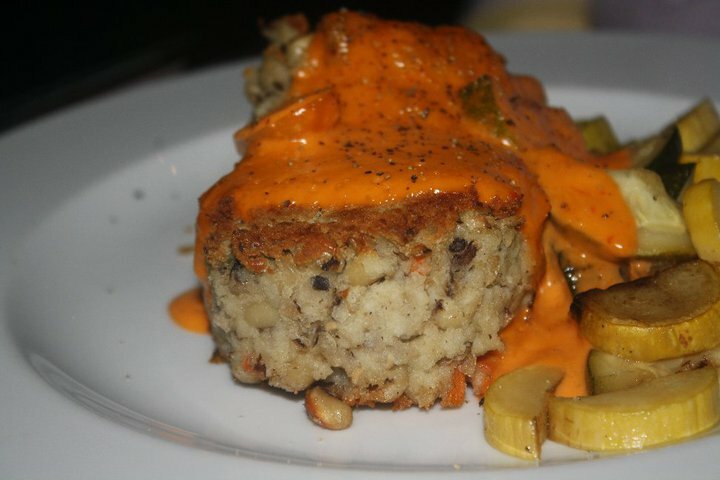 Jason and his crew at 18 Seaboard definitely know how to cook a meal and serve it up to their patrons. Will be returning! Maybe just for peach salads, onions, and ice cream! I think I could handle that.